Every year we love creating new autumn designs. As you have seen from our past releases, we have covered a lot of bases including leaves, scarecrows, cornucopias, wreaths and many more. In one of our art meetings the idea was thrown around to create autumn decorated doorways and that is how this collection started. 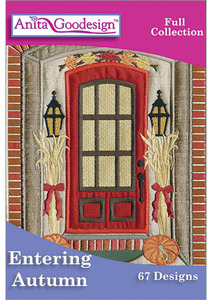 We have also included pumpkins with beautiful damask patterns and an assortment of other autumn designs. The designs are all elegant and beautiful. There are over 30 designs in this collection and most of the designs come in multiple sizes. Designs for the 5”x 7”, 6”x 10”, and the 8”x 12” hoops.